Enzymes are biocatalysts and highly specialized for accelerating various types of chemical reactions without undergoing self-changes. Specialty enzymes are used for special purposes in low volume and high value added applications. These enzymes are currently employed in various applications in DNA manipulation, research and biotechnology, etc. There are many types of specialty enzymes available used for diverse specialty applications which includes proteases, polymerases and nucleases, carbohydrases, lipases, dehydrogenase, and oxidases. According to the research report, the global specialty enzymes market is expected to be worth US$3,726.4 mn by the end of 2025 from US$1,782.0 mn in 2016. The report projects that the global market is likely to rise at a CAGR of 8.7% between 2017 and 2025. Usage of specialty enzymes has resulted in reduced costs of DNA sequencing and manipulation, which has been a significant driver for the market. This factor has played a major role in bolstering the demand for specialty enzymes in areas of biotechnology, research and diagnostic applications. Biocatalysts are used in the production of pharmaceuticals and other fine chemicals; they are included in specialty enzymes due to their relatively low volume use and high value-added nature. Overall demand for biocatalysts is expected to increase at a strong pace, as drug and chemical manufactures continue to search for biocatalysts as alternate methods of production looked to overcome rising production costs. On the basis of application, the global market is segmented into research and biotechnology, diagnostics, and other specialty. Of these, the research and biotechnology segment is expected to soar at a CAGR of 8.7% between 2017 and 2025. The growing investments in research and development and biotechnologies such as DNA sequencing, immunological assays, detection of RNA, molecular testing, tissue dissociation, and others have led to higher adoption of these enzymes. The report indicates that widening applications are likely to open up newer avenues for growth in the coming years. On the other hand, the diagnostics application segment is also likely to tread a positive path with increasing focus on developing accurate diagnostic tools. 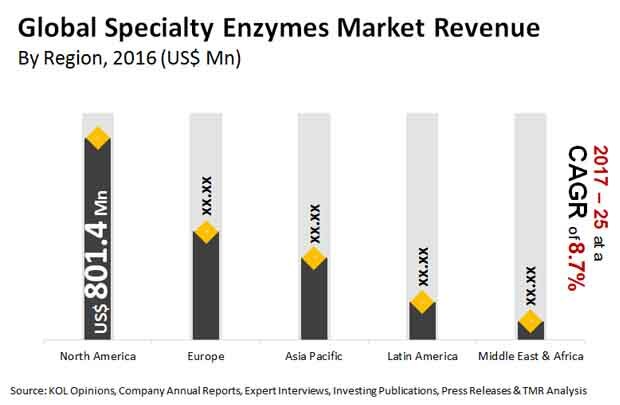 By geography, global specialty enzymes market has been segmented into major five region: North America, Europe, Asia Pacific, Latin America and Middle East & Africa. In 2016, North America and Europe accounted for the largest share of the global specialty enzymes market. The U.S. dominated the specialty enzymes market in North America, accounting for around 89.8% share in 2016. This dominance is majorly due factors such technological advancements in biotech & research with rising demand of enzymes, extensive R&D practices and increasing use of enzymes by pharmaceutical companies, rising awareness of enzymes as nutraceuticals are driving market growth. However, Europe is saturated and growing at slow steady rate while Asia is anticipated to witness the fastest CAGR during the forecast period with major contribution of countries such as India, Japan and China. New product launches with broaden applications, favorable regulations, and growing awareness are likely to drive the market in Asia Pacific during the forecast period. The key players operating in the specialty enzymes market are Novozymes A/S, Amano Enzymes Inc., Codexis Inc., Advanced Enzymes Technologies Ltd., Affymetrix Inc., BBI Solutions, Roche CustomBiotech, Biocatalysts Ltd. and Amicogen Inc. The global specialty enzymes market is dominated only by few players that operates global market.